Neteller is one of the most well known and popular online ewallets. It acts like a bank, except of course it is not a bank. You can not get a loan from these people. You can only move your money into and out of your Neteller account. It is literally an electronic wallet – you put your money, from you bank, into your Neteller wallet, and leave it there until you need to pay for something. You can sign up for an account on the Neteller website. The benefits of using this service instead of moving money directly from your bank account to the poker room you want to play at include the speed with which you can transfer money, both into your poker account, and back from it to your Neteller account. Also, the transaction charges are quite reasonable. As it is widely accepted, once you have a funded account, you should have little trouble moving your money around. Before you get started you will need to create and verify your account with Neteller. in order to use the service, you need to hook your ewallet up to your bank account or credit card. You need to have some way to get real money into your account, before you can move it into a poker room. Doing this is a little complicated, but not too much. When you create your account, you enter the details of your personal bank account into the system. After you have done that, neteller will send a random amount, usually less that two dollars, to your bank account. You then need to see this transaction, either through online banking for a much faster process, or in your paper statement. 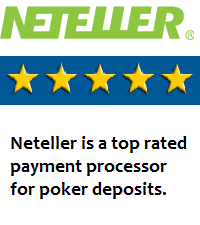 Once you know the amount of this deposit, you enter that number in the place provided in your Neteller account. Along with your photo identity documetns and proof of address that you will have to send in, this process proves that you are indeed the owner of the bank account in question. Once you have done all this you are good to go. You can fund your account by bank transfer, or have someone who you know that already has an account here send money to your new account. Once the funds are in your account, and cleared, you can transfer them to any site online that accepts payments this way. After you have been through the verification process you should not have to do much after that. Just use your account to transfer your funds around the internet. You can apply to get the Net+ MasterCard debit card on your account, too, and that will give you immediately access to your online funds. You can use that card anywhere MasterCard is accepted, which is everywhere, or you can withdraw funds from any ATM. Overall, Neteller is a quick, cheap and convenient way to maage your online funds, especially so for online poker players. The costs are reasonable, and the service is good. I have never had a problem with this business, and I have had an account there since 2001. Like all good businesses, Neteller operate a rewards program for their customers. You earn points simply for transferring your money in and out of your account. Basically it is like rakeback. The points can be used in the rewards stoe to get various cool items, or to exchange for cash. The more money you transact, the higher level of VIP you can become, which brings more benefits including reduced fees and reduced foreign exchange rates. None of the online payment processors have really good customer support. It seems to be a part of the business model, or else they are just so busy that they are not able to offer a good service to their customers. Of those that I have experience with, Neteller has reasonably good support. Not great by any means, but good. In order to get in touch with support, their contact details are available on the Neteller Customer Support Page. You have a number of options, including phone, which works best. Email support can take quite a long time to fix your problem. Should you have an issue with your account and you find yourself dealing with a support agent that is less than helpful, there is a way to get around that. When you email in your support issue, you will get an automated response, then shortly afterwards you will get a response from a support person. If that response is not helpful to you, if it seems that nothing is being done to resolve the issue, you have the option of copying your original email to complaints@neteller.com. I have found that instead of wasting time going back and forth with someone who can’t or won’t help, just repeatedly telling you to ‘wait’, copying all correspondence to the complains address gets things resolved quickly, if the issue can actually be resolved. I don’t guarantee that this will fix every issue that comes up, but I know that it did work for me when I had a problem with my account. Neteller is highly recommended as a payment processor for online gamblers. It is a “must have” for anyone serious about playing poker online.